Villa Mara offers more than a simple vacation. 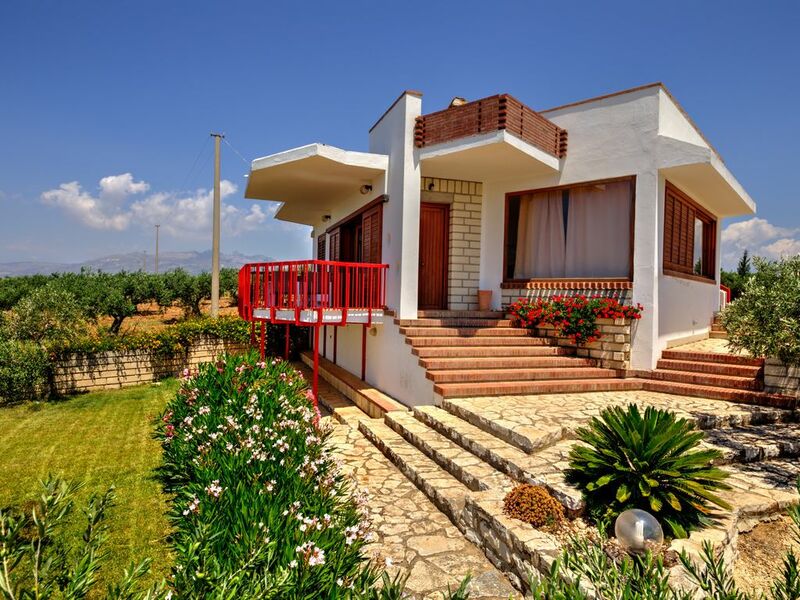 It offers a unique experience: the best of the sicilian countryside, full of colours and flowers, the excitement of the valley of the temples and the most uncontaminated coast of sicily in one location. Here it is possible to combine the rustic tranquillity of a magical landscape with the excitement to discover every day a new lost paradise of nature and sea!!. particularly bright thanks to 2 big windows, one in the living-room area and one in the dining room area and a big opening on the balcony with a view on the sea; 2 finely furnished bedrooms with windows overlooking the garden, a kitchen, a bathroom with shower and a little laundry. The villa is equipped also with a nice and very well equipped outside barbecue area. Ribera boasts marvelous beaches: “Borgo Bonsignore” is a famous beach area thanks to its uncontaminated coasts and to the natural reserve of “Foce del fiume Platani”. “Piana Grande” is a sandy and pebbled beach where admiring the typical Mediterranean vegetation; it is a really loved place from young people, since the seafront is crowded of people who go there to enjoy themselves in the summer nights. “Secca Grande”, the most renowned beach place of Ribera, is the ideal place for those who love both the uncontaminated beaches and the amusement, since it is full of bars, clubs, restaurants and there are a lot of cultural events and entertainments at nights. Lovely villa with great views. A few problems which the owner promised to rectify. I am sorry you had problems with the washing machine and with the mixed of the shower, but they will be fixed very soon. Very nice secluded place but quite basic. The ideal place for relaxing. The owners are very charming and helpful people. Lovely peaceful location (down a very bumpy track from Ribera!). We loved sitting on the balcony (particularly at sunset) which has far reaching views towards the sea and mountains. Please note the sea is not a 10 minute walk as suggested by one reviewer - we put this to the test despite our doubts - and gave up after 40 mins of walking down a track that didn't really lead anywhere. Ribera is only really good for supermarket shopping (Lidl is the largest and has the best choice). During our 2 week stay, some of the places we visited include Sciacca, Caltabellotta (highly recommend Ristorante M.A.T.E.S for an authentic Sicilian, home cooked 4 course set meal for around 30 euros a head), Valley of the Temples, Mazara del Vallo and Scala dei Turchei (also recommend). For an extra special meal, head to Cantine de Gregorio (the other side of Sciacca) - where you can get a tour of the winery and a set dinner with wine tastings for 50 euros a head in a lovely location. Absolutely worth travelling that bit further and not bad value for fine wining and dining (all included in the price)! Villa Mara is absoluut een plek om van te houden: wij werden er verliefd op. De on-meditteraans grote ramen die heel veel licht binnenlaten en een geweldig uitzicht bieden naar zowel het dorpje als de zee, de olijfgaard rondom, de rust, inderdaad, de vogeltjes en de krekels, zonsondergang vanaf je terras. Geweldig. Toch is het huis niet perfect. Isabelle en Francesco gaven dat bij aankomst ook direct aan: het huis heeft jaren leeg gestaan, het is met vrienden weer opgeknapt, en het heeft wat kleine onvolkomenheden. Die zijn in enkele gevallen te onbeduidend om te noemen, zoals de deur van de koelkast die je even moet optillen voordat deze sluit, de voordeur die klappert als het waait – wij staken er een enkele keren dubbelgevouwen A4 onder –, de douchekop die niet te verstellen is en waarvoor je met je 1 meter 83 even door de knieën moet … Toch 5 sterren? Absoluut! Deze zaken vallen weg als je kijkt wat je ervoor terugkrijgt. Francesco en Isabella doen er alles aan om de villa nog comfortabeler te krijgen. Bijvoorbeeld de achterdeur heeft sinds een vorige review een extra schuif gekregen waardoor iedereen de deur op slot krijgt. En het keukenblad en de koelkast lagen zo vol met eten en benodigdheden dat we de eerste avond – we kwamen in het donker aan – er niet meer uit hoefden om boodschappen te doen. Olie, azijn, brood, beleg, pasta, saus, water, wijn, … alles aanwezig! Overigens is de kronkelweg naar het huis gewoon geasfalteerd, zie reviews hiervoor; er zitten hier en daar wel wat gaten in. Onze Fiat 500 had er geen moeite mee. De rust is geweldig, in de olijvenpluktijd kwam er hooguit elk kwartier een auto voorbij, voor de rest: stil! Capada is een goed restaurant in Ribera, Lido Garibaldi aan het strand in Ericlea moet geweldig zijn maar er was stranderosie en daarom was het gesloten; daarentegen vonden we het strand van Bovo Marina geweldig, haast een privé-strand zo rustig, 3 kilometer gelopen zonder iemand tegen te komen. Aan het begin Solera Beach, een heerlijk strandtentje met verse vis en aardige bediening, auto staat op honderd meter afstand. Voor 30 euro met z’n tweeën geluncht. En de zee: in oktober was het 25 graden, de zee 23 graden, niemand te zien …. Ongekend! Located in a stunning situation with views to die for. Wonderful outdoor space and inside the villa everything one could wish for. Francesco could not have been more helpful. The only downside is that the shower is really, really small and the doors and windows are in need of a bit of maintenance. Unless you're really quite tall it is impossible open the back door. The nearby town of Ribera is without interest. Villa Mara is characterized by an excellent position and a lovely landscape combined with the quietness of a rural and cosy house not far from some beach paradises. It is located in Ribera, a nice village which rises on a wide hill nearby Agrigento and famous for its international oranges production, so that it is known as “City of oranges” all over Europe. Ribera is surrounded by gorgeous, uncontaminated and also unknown beach places; their long, white, sandy beaches will take your breath away! Some of them are natural reserves thanks to their beauty and their wildlife conservation. One of the most beautiful is “Foce del Fiume Platani”, a protected area between Borgo Bonsignore and Capo Bianco, whose calcareous cliffs rise up marking the landscape incomparably. This area is characterized by sandy dunes, mouth zones, hill landscapes and Mediterranean wood that blend harmoniously each other. “Torre Salsa” is another natural masterpiece, located between Siculiana Marina and Eraclea Minoa. Its peculiarity are the chalk and clay cliffs and the very bright sea, whose bottom is marked by a rich blooming flora and fauna. The six kilometers of wild nature encompass jagged shores, golden and secluded beaches, sandy dunes and uncontaminated paths which will fascinate sea and nature lovers. Furthermore you can admire the old famous sighting tower that dominates the top of a little promontory in the very centre of this oasis. What you mustn’t miss is “Scala dei Turchi”, a singular white cliff made by limestone and clay which rises along the coast of Realmonte and overlooks a crystalline sea. Its name comes from the Turkish invasions. According to an old legend, the Saracens got there from the sea and climbed the cliff until the top; once there, they attacked the local people. It has became a tourist attraction for its particular color and shape; wind and rain have modeled it throughout the time, creating a huge natural staircase whose lines are rounded and irregular. Its white rocks look brighter thanks to the sun light and the water is incredibly clear.. it’s a paradise! Villa Mara will offer you this and a lot more. You will experience the emotion of a special vacation combing the typical rustic quietness, magic landscapes, sea and natural paradises but also marvelous cultural routes. One of the most beautiful and oldest carnival in Sicily and Italy takes places in Sciacca; there are six days of celebration with featuring impressive allegorical parades. The atmosphere is full of color, pure fun and cheerfulness, everyone takes part in celebrations.